Misplaced Heart is a collection of poems, and some prose, in which Dean expresses the discoveries of her inspiring journey of faith. She shares the throbbing pain of suffering and her delight when God turned her sorrow into joy. Misplaced Heart is the story of a woman's struggle to find faith in God. Her father dies when she is seven. Her first son suffers with leukemia and dies when he is three. The life of another son is threated by serious surgery. Her marriage is nearly destroyed as she struggles with her desire for a big house filled with lovely antiques. Through years of pain and tears, she finally discovers the true meaning of life and peace with God. As she tells her story, Dean Albritton expresses some of her spiritual discoveries in poetry. 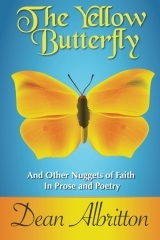 Many of her delightful poems are woven into this inspiring journey of faith. You will laugh and cry, and admire her courage, as you read her exciting story. Your own heart will be blessed as you read this story of a woman who has moved from fear to faith, from sadness to joy, from emptiness to meaning. This is a book you will enjoy sharing with your friends.